On July 28th I was sent on a quest by fellow Kiwi blogger, Gallivanta from Silkannthreades. A totem pole quest. She dedicated a post to me in honor of the release of my third book, Nola Fran Evie. But the dedication came with a proviso…I had to locate a totem pole by Chief Lelooska somewhere in Portland. And so I began my quest. Totem Pole, I’m comin’ to get ya! Like any modern-day hero, I used my trusty compass, the Internet, to search for the totem pole. I wore a smug look on my face as I let Google do the work for me from the comfort of my home. But, I couldn’t find its exact location. However, I did step into the world of Chief Don “Lelooska” Smith, a great man who was given a great name at the age of 12—“He Who Cuts Against Wood with a Knife”. And cut against wood with a knife is what he did…all his life in beautiful Oregon. The man carved thousands of masks and over a hundred totem poles, including the one I was hunting with the replica in New Zealand, until he died of cancer in 1996. So, what’s with the New Zealand connection? 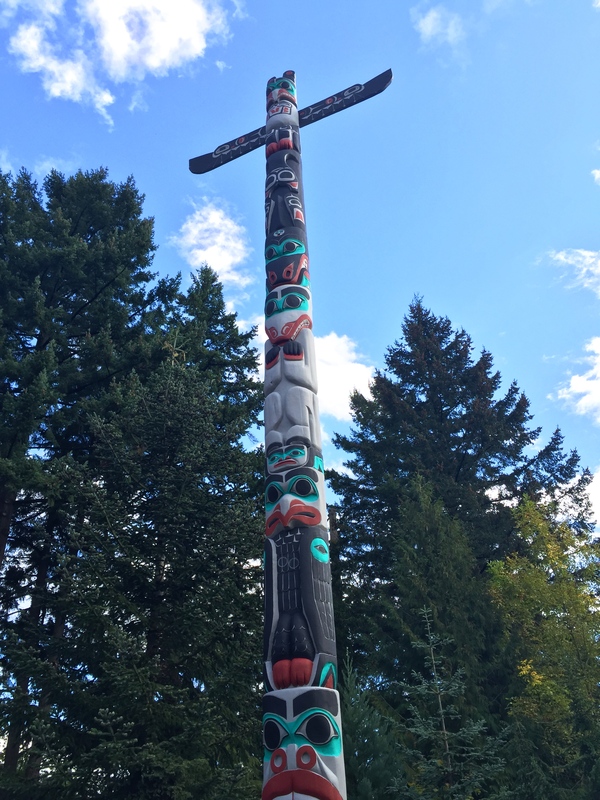 During the 1959 Oregon Centennial Exposition, the intricate pole was carved from cedar to honor Oregonian soldiers who participated in Operation Deep Freeze, a famous multinational series of exploratory missions to Antarctica during the late 1950s. The base for Operation Deep Freeze was Christchurch Airport. Aha! I found you, Totem Pole! Ecstatic, I called the zoo to plan my heroic visit. After weeks of online research I imagined staring proudly at the totem pole, and how I would gleefully show Gallivanta that I had completed the totem pole challenge in less than a month. But…the totem pole wasn’t there. I panicked. Surely the zoo didn’t get rid of this exceptional piece of tribal artistry that had been living there for decades. Surely not! 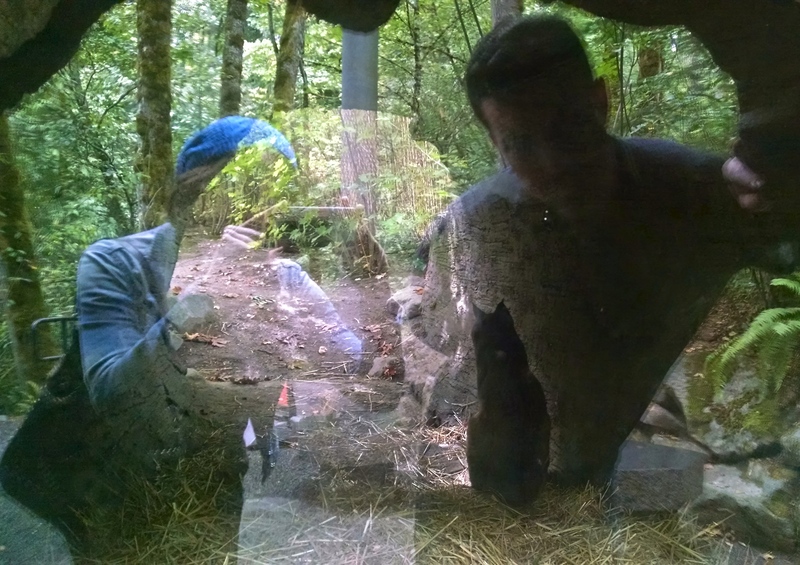 Last year the Oregon Zoo began a major transformation to create the Condors of Columbia, which opened in May, and Elephant Lands, a project I’m very excited about which is opening in 2015. This expansion will quadruple the space the elephants inhabit, drawing on more than fifty years of research and science-based care to build a natural environment to honor the animals. Come on, who doesn’t love elephants?! During this time, the pole underwent a hefty restoration process—repairing cracks and rot, as well as painting, cleaning and detailing the carving. It was an intense team effort led by Lelooska’s brother, Chief Fearon “Tsungani” Smith, assisted by zoo volunteers, and overseen by the Lelooska Foundation. This totem pole’s kind of a big deal. 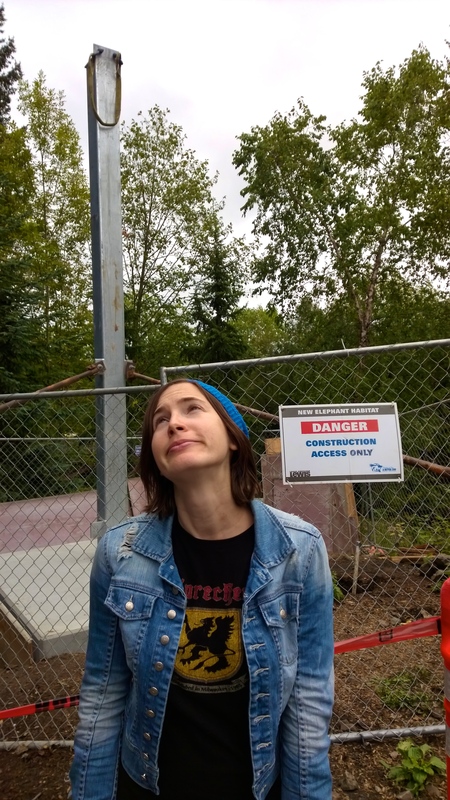 Wayne and the Oregon Zoo were excited to hear about my totem pole quest and were generous to bring my husband, Mr. H, and I to the zoo when the totem pole was back in action. It was finally happening. Now at the end of September, I was coming to the end of my quest. I was beaming with pride, eager to see the elusive totem pole I had chased for two months. I went on the wrong day, before the pole was resurrected. I know, I know. But, we made the best of it and enjoyed a leisurely stroll through the zoo. 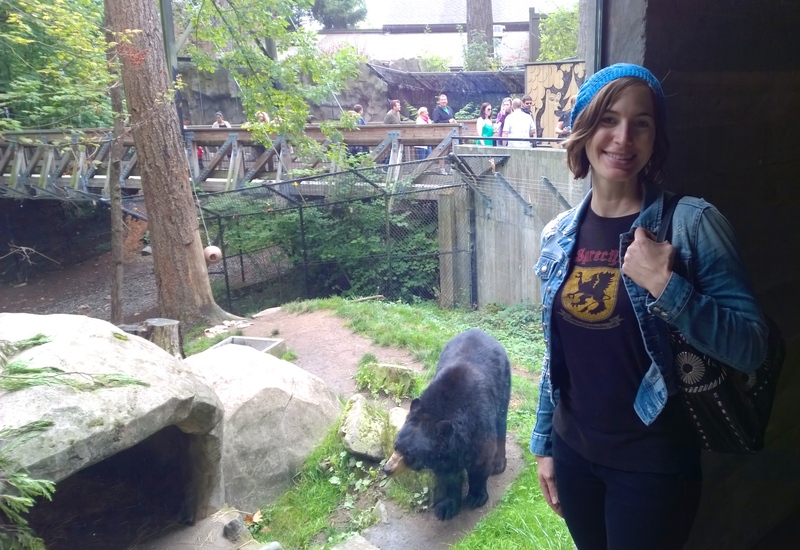 This bear and I had matching outfits. 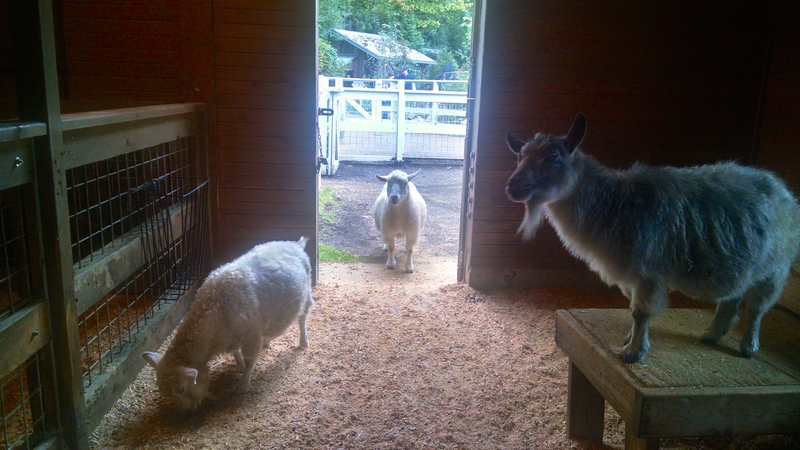 This goat trio looked like they were posing for an album cover. This bobcat let us hang out in his cave. I skipped the carcass feeding. But Mr. H seemed satisfied. The following Monday I sheepishly admitted my mistake to Wayne from the zoo. He was nice enough to pat me gently on the head and invite us back for another visit when the pole was actually there. This is truly one of the best zoos I have ever been to and I look forward to Elephant Lands opening next year. 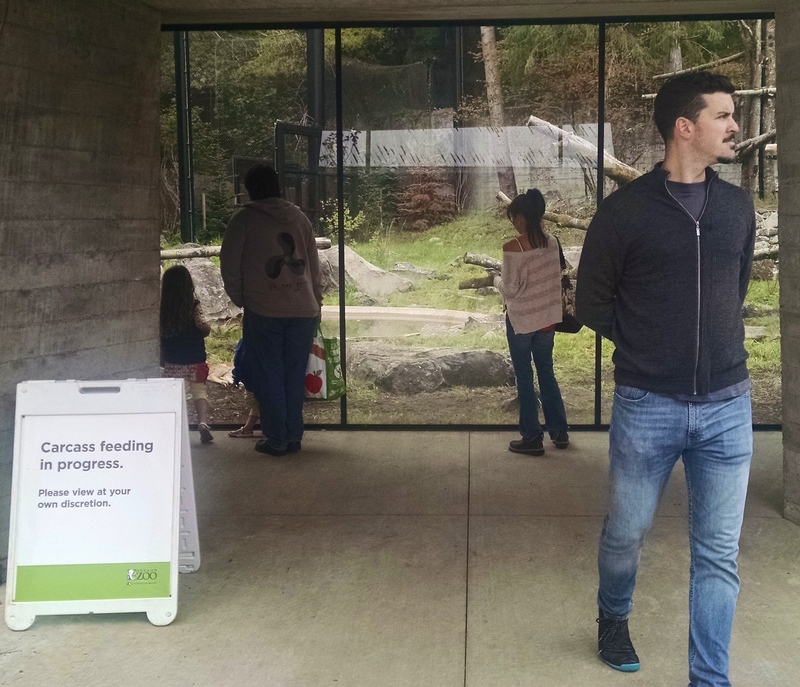 A big thank you to Wayne and the Oregon Zoo for being so awesome during the totem pole quest. 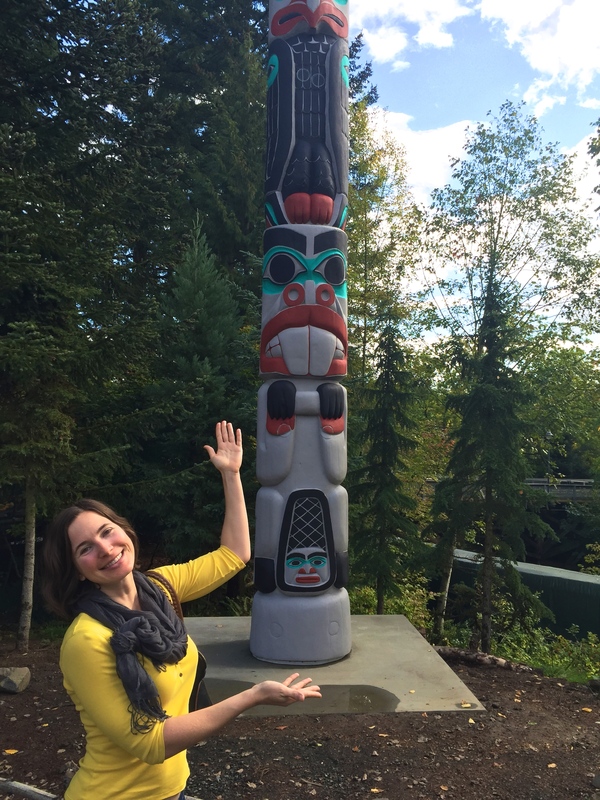 I fell in love with totem poles when I lived (briefly) in Alaska. Being in that type of setting, living among many Tlingits, and hearing about the artistry and meaning behind them made it impossible not to be awed. Must have been such a wonderful experience. So cool! I haven’t been around totem poles at all, so this was a real treat! I love anything with artistic meaning. Britt what a fantastic story and challenge. I love that you arrived back at the zoo too early. I would have done this too. The quest was lots of fun! Yep, I was a complete dope. Mr. H looked at me with that WTH face, then we busted out laughing. Haha! The goofs are often the best part of our adventures, aren’t they? Very cool! I’m checking this out!